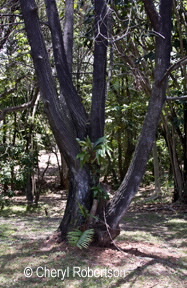 This tree may grow to 30 m, branches spreading, leaves much reduced. Reproductive structures form cones. 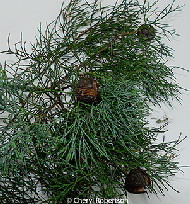 The male cones are solitary to 3 mm long maybe grouped at the ends of branchlets; female cones are solitary 12-18 mm diameter with 6 cone scales which separate almost to the base at maturity. Scales are of 2 sizes, outer 3 much reduced; seeds numerous, winged.